Kate spent the evening watching the Olympic hockey match between Great Britain and Pakistan. 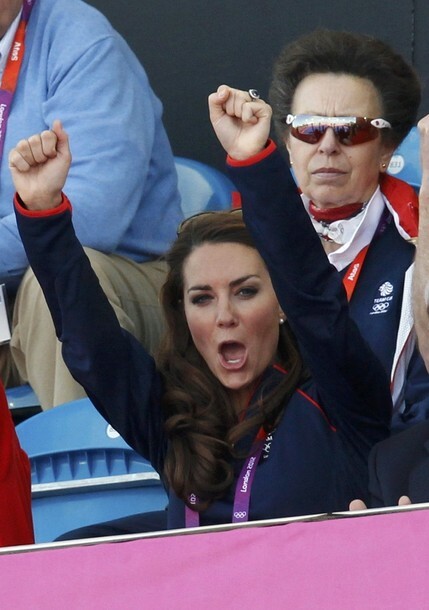 Kate cheering on Great Britain who triumphed with a score of four goals to one. 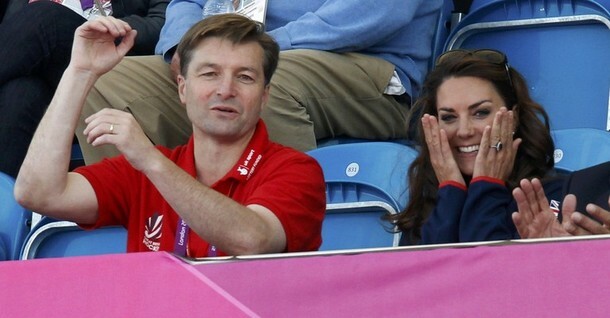 Kate sat next to GB hockey president Richard Leman. 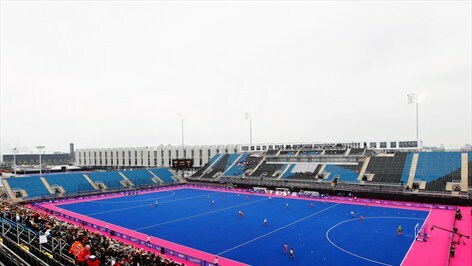 London 2012 is the first Olympic games where the hockey pitches aren't green. Pink is used for the area surrounding the pitch and blue for the field of play. The Riverbank Arena is an inspiring and modern venue. Kate visited the Riverbank Arena and played hockey with Team GB earlier this year. 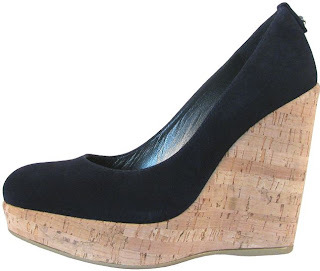 Kate wore (what's becoming known as her Olympic uniform) a Team GB fleece, J Brand Jeans and her £245 'nice blue' Stuart Weitzman Corkswoon Wedges. So what were the Princes up to while Kate watched the games? 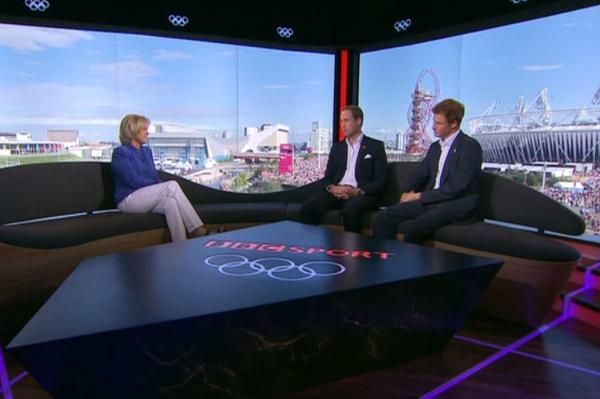 William and Harry completed four interviews, including one with the BBC, but unfortunately Kate didn't take part in them. From the Channel 9 interview. You can watch the channel 9 interview here. Afterwards the couple visited the Team GB house. Singer Katherine Jenkins was also present. 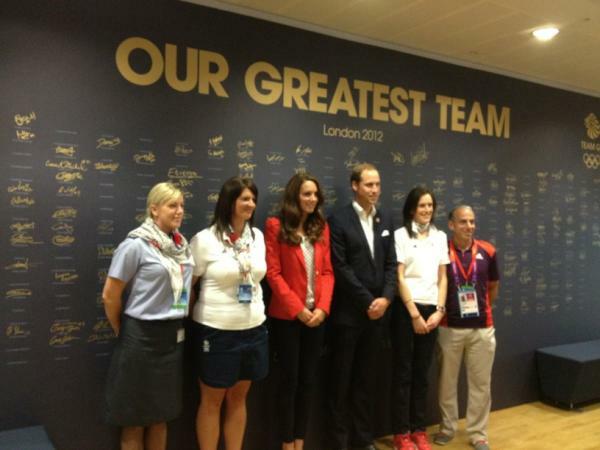 William and Kate met with athletes, military personnel and gamemakers. 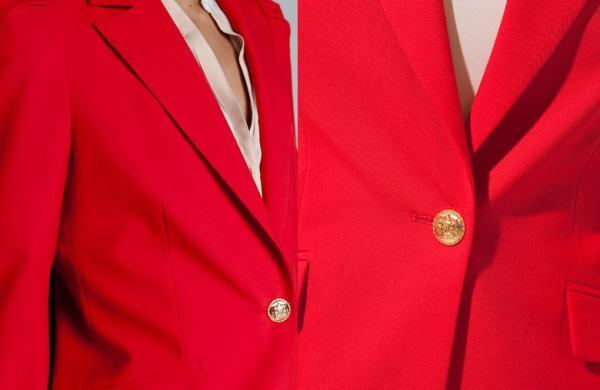 Kate appears to be wearing the red ZARA Blazer with gathered shoulders. It is available for £79 and a lovely choice. Kate also wore a white and navy polka dot top with Zara jeans. William and kate will watch the swimming next. I saw the interview, it was really lovely ~ they are great ambassadors! When they mentioned that the DoC's might be running the London Marathon next year my first reaction was great but if they do WHEN is there any time between Royal Tours and training for a marathon to have a baby????! I hope the marathon running for Kate is delayed and the baby is on the cards...fingers crossed!